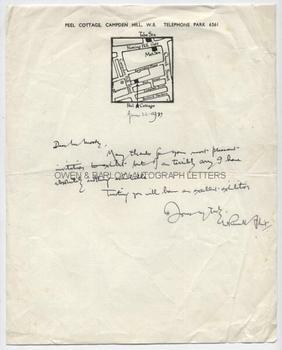 WILLIAM RUSSELL FLINT AUTOGRAPH Letter Signed. British (Scottish) artist best known for his often controversial watercolours of women. ALS. 1p. Peel Cottage, Campden Hill, W.8. June 22nd 1937. To [Victor Hume] Moody. "Many thanks for your most pleasant invitation to exhibit but I am terribly sorry I have absolutely nothing available. Trusting you will have an excellent exhibition.". 4to. Approx 10 x 8 inches. Slight creasing, else fine. From the studio archive of the Malvern artistsVictor Hume Moody and his daughter, Catherine Moody. V.H. Moody was principal of the Malvern School of Art (1935-1962) in which post he was succeeded by his daughter. He is sometimes known as "the last classicist" painter. He was known for his classical compositions, nudes and portraits. He was associated with the Malvern Festival and arranged several exhibitions of works by figurative artists, in which connection he had invited William Russell Flint to exhibit.